Back in 1975 nobody would of imagined the impact Saturday Night Live would have on television and popular culture. Forty years later the show is still on the air, and next week Lorne Michaels is celebrating with a 40th Anniversary Special. The three hour show looks to be a treat with a long list of stars returning to Studio 8H. 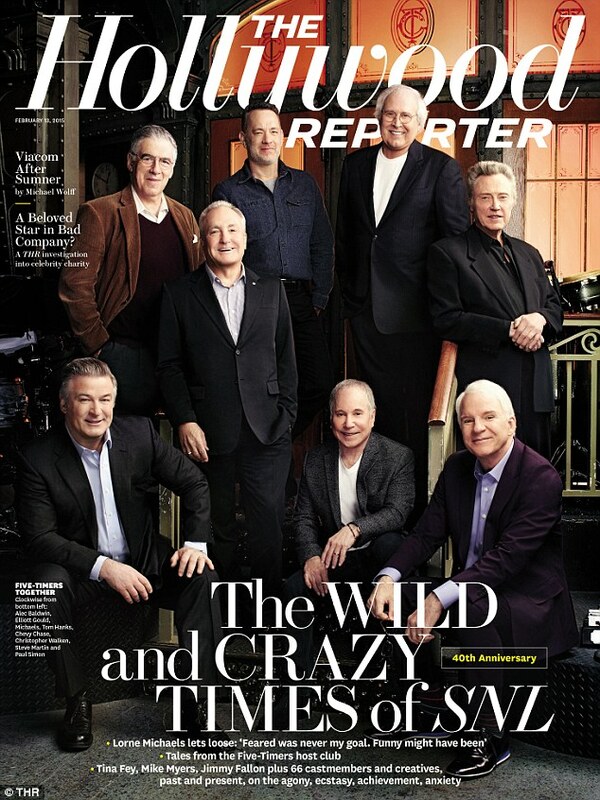 Lorne and members of the five-timers club also have graced the cover of The Hollywood Reporter this week. Check out the cover and the stars who will be on the 40th special down below. Clockwise from bottom left: Alec Baldwin, Elliott Gould, Michaels, Tom Hanks, Chevy Chase, Christopher Walken, Steve Martin and Paul Simon. I just missed out for tickets to The Tonight Show starring Jimmy Fallon for my trip to New York. Recently I have slowly been plowing through Bill Carter’s The War For Late Night: When Leno Went Early and Television Went Crazy, getting an in depth and well crafted look into the 2010 Tonight Show host and time slot conflict. The events presented by Carter are fresh to me, as when I was younger names like Conan O’Brien, Jimmy Fallon, and Chelsea Handler were not apart of my, now pop culture invested, life, while the two heavy weights of late night, David Letterman and Jay Leno, were known to me, but on a very small scale. It is now less than a week after Letterman’s announcement of retirement, I fear that Carter may be getting ready to pen a follow up to War For Late Night that could be billed as the third in his Late Show trilogy (Carter first documented the 1992 Tonight Show host conflict between Letterman and Leno in The Late Shift: Letterman, Leno, & the Network Battle for the Night published in 1994). The 11.30 P.M game is in for a big shake up, and not everyone will come out of it being a winner. In regard to Dave’s announcement, praise from other public figures such as, Fallon, Jimmy Kimmel, Ellen DeGenerres, Steve Martin, Billy Crystal, and even the President Barack Obama, was shown through their Twitter accounts, but instead of offering the same praise and recognition, most of the entertainment reporters and sites were focusing on who should be his replacement. This is full while knowing that Letterman will be with us on the air for at least another solid year. The Los Angeles Times couldn’t resist the headline, ‘With David Letterman retiring, all eyes on CBS’ next move”. Shouldn’t all eyes be Dave, and his fantastic contribution he has made to television. I guess it must be human nature to speculate about such things, but I was surprised at how many reporters were busy making their own shortlist’s for replacements, all featuring Stephen Colbert and Handler in top contention, while little were looking at Letterman’s achievements. Many need to take a second to note that David Letterman has been on the our television screens, whether it be at NCB or CBS, since 1982. While Jimmy Fallon’s Late Night, and now Tonight Show, flourishes on using Twitter and Youtube to its advantage, those were non existent for Letterman, and others in the field, in the eighties, nineties, and early two thousands. To date he has filmed over 6,000 episodes of The Late Show with David Letterman, and by the time he finishes up, he will have spent more years on the air than the king of late night television, Johnny Carson. The thing that bugs me most about the lists of replacements is that, even though it is unlikely he will get the job, Craig Ferguson, host of The Late Late Show which follows Letterman on CBS, is not at the top of them (Jesse David Fox and Josef Adalian from Vulture.com has been the only site I’ve seen to list him a top of a candidates list). When your long standing sports coach steps down, do you first interview the assistant, or to you scout out other talents? You first interview the assistant. Look maybe Ferguson doesn’t even want the earlier time slot with more pressure to perform (am I kidding myself, anybody his Ferguson’s position would want that slot), and maybe CBS will have no choice but to go with someone else due to Ferguson’s style, in the same way that Conan O’Brien didn’t work out on NBC’s Tonight Show, as he keep his same style from Late Night, while the NBC executive expected him to continue on with Leno’s ways keeping a broad audience. If Ferguson does in fact get over looked for the gig, which could cause some brand damage to the station, he will be getting a nice pay check for it. His previously inked deals with CBS include a “Prince of Wales” clause meaning Ferguson has the right slide into Letterman’s seat. We all know that if CBS really doesn’t want him to take on that role, a payout, reported between $8 to $12 million, will take place, and most likely Ferguson would walk, leaving not one, but two, shows for CBS to find a host for. Others featured on the list of potentials are Colbert, who’s contract runs through 2014. Handler made an unexpected announcement that she would leave E! and her show Chelsea Lately once her contract expires at the same time of Colbert, making her available for the Late Show gig. Many believed that maybe a deal had already been struck, as it couldn’t be a coincidence that both announce major news like that within days of each other. Bravo’s Andy Cohen, and O’Brien, who has been at TBS since he walked from the Tonight Show are up for contract renewals in 2015. Even Jimmy Kimmel’s name has been thrown into the mix, as his contract is also up for renewal in 2015. Some have even dared to suggest Letterman’s long time rival, Leno would even be considered. I think Jimmy Fallon’s joke during his “Top Ten reasons David Letterman is retiring”, put it best, by saying “Jay Leno needs a partner for next season’s Amazing Race”. The joke was funny, but it really is true that Leno needs to move away from television, just as Letterman is. Actor’s and actress’ like Jerry Seinfeld, Tina Fey, Neil Patrick Harris, Louis C.K., Chris Rock, and Ellen DeGeneres (who you would think is comfortable in day-time television) have all been considered by reporters. It’s known that CBS are looking to find a replacement sooner rather than latter, which is the right way to do things, so Letterman can enjoy his final year without the focus being on his successor. When looking at my own views originally I would of given Ferguson the job straight away, and if CBS wants to go with honor and integrity they will most likely go with him, but if they are playing to win, not playing to be nice, then they will most likely go with someone else. While Colbert may be the most critically acclaimed, winning over the critics may not be whats needed to win over The Tonight Show Starring Jimmy Fallon. CBS needs to attract the young audience. My suggestion would be to bring in Handler (who is already known to be a free agent on the move), who would bring in a heap of female viewers, or Neil Patrick Harris (it is unknown if he would even be interested in such a gig, but being such a popular entertainer, and familiar with young faces after finishing up nine years on How I Met Your Mother, he would be just what CBS are looking for). Handler would really create a point of difference between the three commercial networks. From 2010 onwards we have had Leno, Letterman, and Kimmel. This year we have the two Jimmy’s, and David. All three slot filled by straight white middle aged men. I’m not saying diversity should be added just for the sake of it. I believe in employing the right person for the job regardless of race, gender, or sexual orientation, but it would help to add someone different into mix. The only thing with Chelsea is that she has worked for a long time to create her own brand and style at E!, and if CBS are expecting her to change things, it won’t work out. That’s why Patrick Harris could be a better fit. Of course at the moment only one shows host needs to be found, but if Ferguson does indeed walk from the show, he has nearly worked on for close to a decade, due to not being chosen for Letterman’s job, then two positions will need to be filled. Maybe room for both of my picks? Who ever is chosen looks to become part of the next stage in late night on television. In the past viewers just had one: Carson. Now they have many. With so many chess pieces to pick from, I’m sure a few of them will be sitting in different positions by August 2015.